The universal mind was becoming my friend, philosopher and guide. I was advancing on the path of life getting all instructions from the universal mind. I was forgetting all my sorrows,anxieties, agonies and grief. My little mind was expanding and across the universe was pervading. Pervading the entire universe I was forgetting the worldly miseries. Remaining above the worldly chaos and conflicts in a beautiful manner I was loving the universal mind. Amidst intense activities I was getting a safe place in the universe. Mind was becoming pure, subtle and concentrated and life was becoming sublime. As the universal mind was giving me much joy and happiness I was smoothly overcoming the challenges of life. Since childhood I was acquainted with the universal mind. I was enjoying the stars, moon, sun and the galaxies with vigor and zeal. Loving the things and beings of the universe I was preparing my studies. In my college days the universe was my companion protecting me from many dangers of life. I was seeing the presence of the Lord in the universal mind in my mid fifties. As I was advancing on the path of life the universal mind was helping me to overcome the adverse winds. Forgetting my loneliness I was coming closer to the universal mind. The universe was whispering in my ears the secrets of life. According to the mind of the universe I was managing the things and beings. Learning the techniques of management I was advancing on the path with vigor and zeal. Imbibing the powers of that mind I was forgetting my anxieties and worries. The mind of the universe was slowly entering my brain,body and mind. Under the stars filled sky and the full moon I was studying the universal mind. Merging in total curiosity I was trying to catch a glimpse of it. Even if I fail in my mind the whole universal mind was behind me. My mind is a part of the universal mind. Thinking of the universal mind I was feeling closer to the Lord and was forgetting all my worries. Loving the Lord and singing His glories I was sleeping inside the slumber of the night. I was dreaming the whole universe in my small mind. Pervading the entire universe I was observing the movement of the things and beings. As the things and beings were seeming luminous and bright I was forgetting all the worldly miseries. I was waking up in the dawn afresh and alive. Looking to the smooth and bright sun I was being rejuvenated and refreshed in my brain,body and mind. 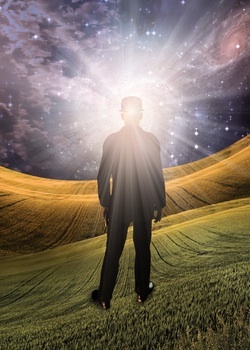 Seeing the mind of the universe within me I was moving to the battle field. With extraordinary powers I was winning the battle of life. I was imbibing the universal mind fulfilling my hopes and dreams. The mind of the universe would help me till the last breath of my life. Merging in that mind in a better manner I was serving my family,organization and society. I was learning discipline in life from the universal mind. Being disciplined I was making all my thoughts perfectly tuned. With a beautiful mindset I was merging in peace and bliss. I was managing my life and the lives of others learning many things from the universal mind.